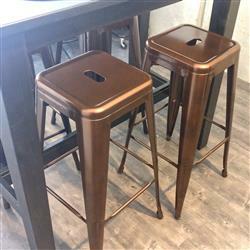 The Tolix Replica Bar Stool in Bronze is a 76-cm-high bar stool with a sturdy metal steel structure. The simple and functional design of this bar stool makes it perfect for a classy and laid-back look. The solid metal steel frame and seat fixings are manufactured for durability and finished with anti-rust powder coating. Its solid seat is stylish and the heavy-duty footrests make it easy to use. To prevent scratches on the floor and ensure stability, this bar stool has rubber on the bottom of each leg. Great fast delivery and the stools loo fantastic! Thank you for this wonderful feedback. 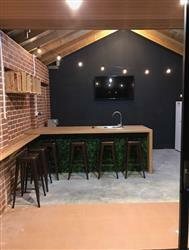 I must say that the stools suit your kitchen perfectly. Cheers, Maria! We are equally ecstatic to hear that your stools blended in perfectly! Thank you for that wonderful review Jonathan. This sounds corny but they are exactly as I hoped for. Sturdy with a very nice finish exactly as pictured. I had no fuss with delivery either. We work hard to meet expectations like yours, and we’re happy to hear that we didn’t disappoint you! Thanks for sharing, Jovin. Thank you so much for such great review, Rod! We are glad that you are satisfied with the quality of the stools and your overall experience with us! These stools are fantastic. I purchased them to sit Teddy Bears on for something different in the room. The service was great and the stools arrived very quickly. Would certainly purchase again.